Parallel processing can be described as a class of techniques which enables the system to achieve simultaneous data-processing tasks to increase the computational speed of a computer system. A parallel processing system can carry out simultaneous data-processing to achieve faster execution time. For instance, while an instruction is being processed in the ALU component of the CPU, the next instruction can be read from memory. The primary purpose of parallel processing is to enhance the computer processing capability and increase its throughput, i.e. the amount of processing that can be accomplished during a given interval of time. A parallel processing system can be achieved by having a multiplicity of functional units that perform identical or different operations simultaneously. The data can be distributed among various multiple functional units. The following diagram shows one possible way of separating the execution unit into eight functional units operating in parallel. 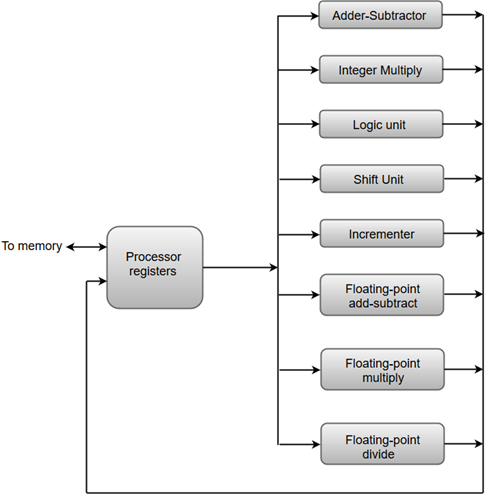 The adder and integer multiplier performs the arithmetic operation with integer numbers. The floating-point operations are separated into three circuits operating in parallel. The logic, shift, and increment operations can be performed concurrently on different data. All units are independent of each other, so one number can be shifted while another number is being incremented.